Children, in particular, those with special needs, often need many breaks throughout their school day to help them focus, stay on track, or calm down in order to sit and participate. If you are in a public school environment, sitting at a desk all day can be a challenge for children. 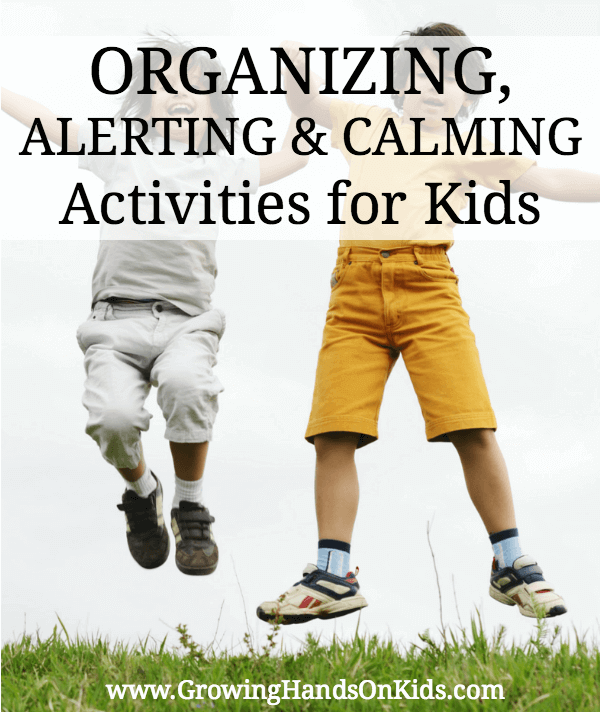 Today I am sharing some calming, organizing, and alerting activities for children. 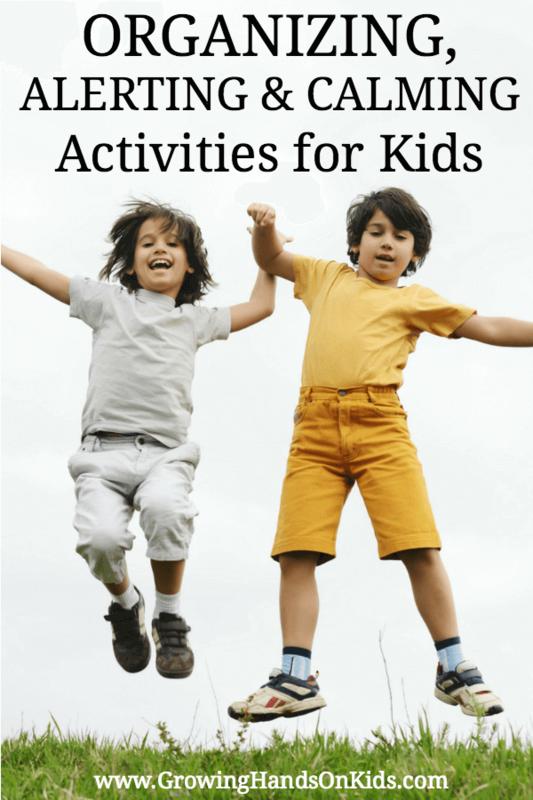 These can be used in school, at home, in homeschool routines, really anywhere. There is also a free printable packet of all the ideas below for you to grab. Wall pushes with hands and feet. Now for some Alerting Activities. These are great to use with kids who are quieter and tend to be lethargic. Also great to use after sitting activities to get the juices flowing again. 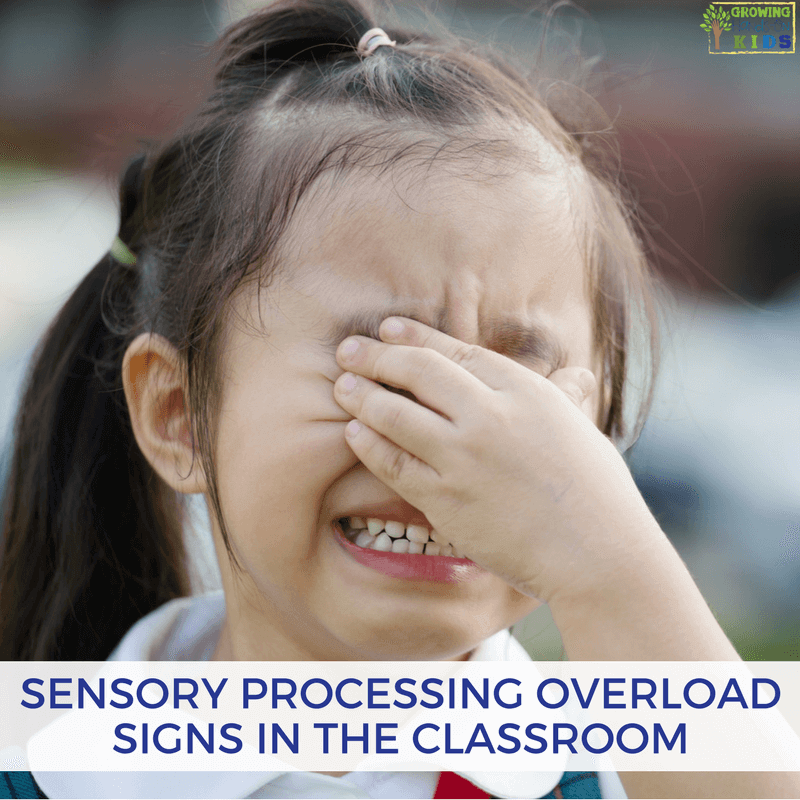 Just make sure you do some type of calming activity after an Alerting activity before asking your child to sit back down to learn and work again. Use two fingers on both sides of the spine, give a light upward stroke 3-5 times. Laying on the floor while an adult rolls a ball over top giving some deep pressure. Light touch/hard touch (depending on the child) – have the student brush a feather over their arms, or squeeze their arms with their hands for deep pressure. Using two fingers on both sides of the spine to give form downward strokes 3-5 times. I have this list available as a free printable for those who wish to subscribe to the blog. As a free gift, I'll send you the Organizing, Alerting, and Calming printable download. Just add your name and e-mail address and then look for a confirmation e-mail (double check your spam folder!). Confirm your subscription with the link in that e-mail. Once you subscribe the download will automatically be sent to your computer. Please double check your downloads folder so you can save it to your computer for future reference. If you are already a subscriber of GHOK, don't worry, you aren't actually subscribing again. This just lets my email provider know which printable to send you. You will not receive duplicate emails from me. 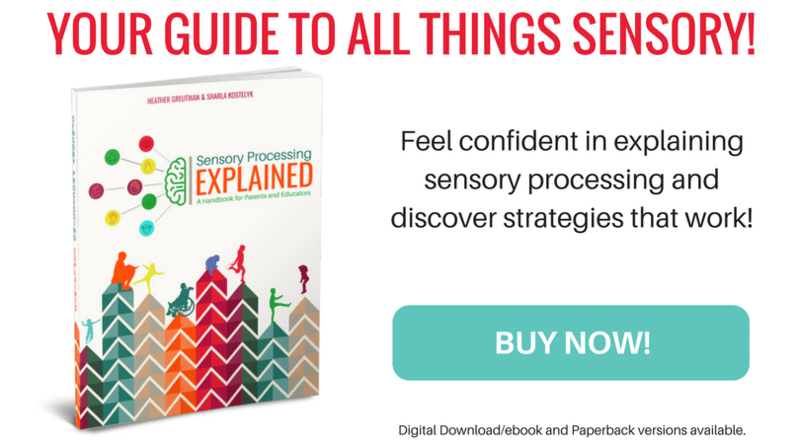 You'll also be receiving my 9 days of sensory processing tips email series. You can unsubscribe at any time. For more tips like this one, you can follow my Occupational Therapy Tips board.